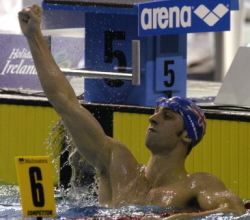 2003 was quite a year for British swimming, with some stunning performances throughout all of the competitions that took place. A record medal haul at the Barcelona world championships threw up numerous candidates for the poll win from the six medallists but also from those who set British or Commonwealth records in their swims. Added to that there were more records and medals at the World University Games and in Dublin at the European Short Course Championships, which traditionally has influenced the voting. All of which would mean that this year’s poll would be the closet run yet, wouldn’t it? Well no it didn’t, perhaps unsurprisingly given the pedigree of the winners, and the final result was a pair of overwhelming victories for the 2003 pullbuoy swimmers of the year. The male swimmer of the year poll threw up few surprises as James Gibson swept the board, garnering almost 60 percent of the votes polled. The Loughborough man took gold and bronze in Barcelona and followed that up with more golden swims in Daegu and Dublin, so was always likely to be a front runner. Fighting out for second were two of the Barcelona medallists in the shape of Ian Edmond and Mark Foster, together with the rising star David Davies, who took several medals at the European Junior Championships. In the end they couldn’t be separated and all three took a joint second place. It was quite a year indeed for James as he took gold medals at each of the major championships he contested, with titles over 100m breaststroke at World University and European Short Course level and of course a memorable triumph over 50m breaststroke at the world championships, the first British man to take gold at that level since David Wilkie some 28 years ago. But Gibson’s year really got underway at the spring trials when he finally made good on the promise he had shown at the equivalent meet in 2002, by improving his 100m personal best to 1:00.48 and setting a new Commonwealth record in the process. As he himself admitted after that swim, it had been a long time coming and he was in danger of being seen as a “one swim wonder”, but having banished that prospect, he went form strength to strength over the season. Gibson is a naturally confident swimmer but his performance at the trials seemed to have given him an added boost and a string of impressive un-rested performances at the mare nostrum meets follower din the build up to Barcelona, but it was in the Catalan capital that the real headlines were made. James’s stated aims were to “swim PB’s and we’ll see what happens.” And that was exactly what he did. Another new Commonwealth record of 1:00.38 took him to bronze in the 100 and that was followed by a strong swim over the 50m event to take a relatively comfortable gold medal, following a new best time in the semi. If the men’s poll was one sided, then the women’s poll was equally so – having become the first British woman ever to win a world championship title Katy Sexton was always going to be a huge favourite and that was clearly shown as she took well over half of the votes cast. There was more of a battle for the minor places as Bill Sweetenham’s swimmer of the year Rebecca Cooke eventually pipped 2002 winner Sarah Price for the second spot. It was also interesting to see Britain’s new crop of breaststroke talent making an appearance as Kate Haywood, Stacey Tadd and Grace Callaghan finished in places five to seven. While the Portsmouth Northsea swimmer might not have enjoyed quite such a great year as her male counterpart, there can be no doubting that her achievements were something special. 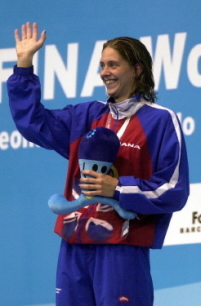 Having dethroned the previously undisputed queen of British backstroke, Sarah Price, at the world championships trials, swimming both 100m and 200m events in Commonwealth record times, Katy went to Barcelona as the number one ranked swimmer in the world. Given that billing, she might have felt disappointed with silver over the shorter distance, especially since her personal best would have been enough gold. But if she was affected by that result it certainly didn’t show as she lined up for the 200m final and produced the swim of her life. And what a swim it was. Clearly her training had been geared toward this event more than the shorter sprint, perhaps taking the longer term view to Athens. Despite getting a slow start she measured her effort throughout the race to perfection as she completed the final 50m faster than the first, sweeping through the field from 4th at the final turn to first at the finish. It was a burst that her rivals had no answer to as she touched home in a very fast Commonwealth record of 2:08.74, the first British woman ever to take a world title. The swim all the more impressive when one remembers that she had never swum below 2 minutes 11 before this year and that much of 2002 was spent recovering from a shoulder injury. Katy’s performances since the worlds haven’t quite matched that level perhaps, and we are yet to get a proper glimpse of her form so far this season but with a solid winter’s training behind her there’s every chance that there will be fireworks at this spring’s trials. With a hopefully rejuvenated Price likely to be on the lookout for revenge, the women’s backstroke events look sure to provide Britain with realistic medal chances at the Olympics and there is every possibility that Sexton could be standing atop the podium once again.